Lisa McCue's fluffy, brown and white "Quiet Bunny" character is one of the cutest little bunnies depicted in children's books today. 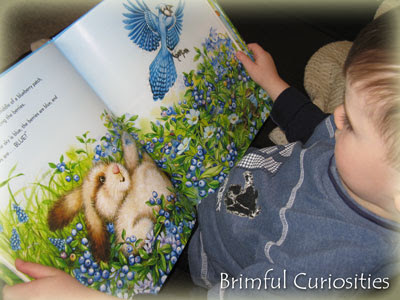 The adorable character made his first appearance a few years ago in the picture book, Quiet Bunny. This spring he's back, ready for a new, colorful adventure in the forest. "Quiet Bunny loves springtime in the forest. He loves the warm sun on his soft little nose. He loves the tickly new grass between his toes. Most of all, he loves the beautiful colors." 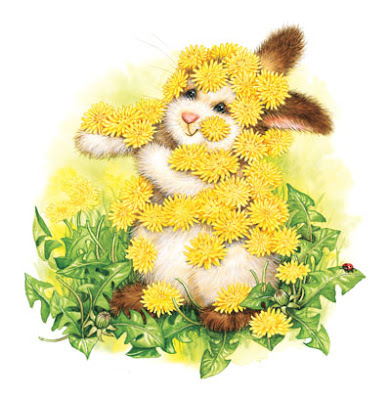 As he observes the glorious colors of spring, poor Quiet Bunny wishes his own drab fur displayed such beauty and color. He hops through the forest, and, through a series of humorous events along the way, manages to add a little color to his fur. A few dandelions turn him yellow, with a lily pad covering he's green, a romp in a blueberry patch results in beautiful blue fur, and a clay mud bath turns his coat red. Sadly, the splendid colors don't last. When Quiet Bunny peers into a crystal blue pond all he sees is a plain brown and white bunny. Luckily, Wise Owl steps up and kindly explains to Quiet Bunny that he is beautiful in his own way -- each and every animal contributes to the natural beauty of spring. Very few artists can capture the glorious colors and sights of nature with such vivid cuteness while bordering on realism. Lisa McCue's color infused illustrations are perfect for children. Nature's colors spring to life! My kids' eyes practically swim in the gorgeous pictures full of tiny details...the hollows in the trees, little bugs on the leaves. Even the text occasionally drips with color. McCue uses several colored onomatopoeic words like "KeRR-SpLashhh" to add expression to her story. Parents and teachers will appreciate that the book quietly and colorfully reinforces the message that every single person, every single animal is beautiful in their own special way. And, make sure to play a little "what is different, what is the same" game with the end pages...such a clever touch by Lisa McCue! Springtime is full of smells, sounds and vibrant COLORS. Use this book as a springboard to practice color recognition and take time to observe the colors of nature with kids. Pair it with Pete the Cat: I Love My White Shoes by Eric Litwin and James Dean for a splashy, colorful preschool storytime. My son and I went on a little backyard stroll today and found colors everywhere: the tips of green daffodil leaves emerging from the brown soil, the blue sky dotted with white clouds, a pink dianthus starting to bloom. The natural world is full of colors! 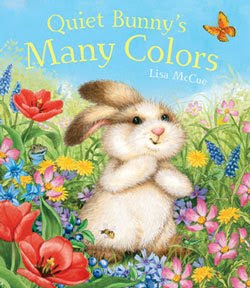 *Images used with permission: Art from Quiet Bunny’s Many Colors©2011 by Lisa McCue, Sterling Children’s Books. So cute and colorful! Looks like a wonderful book for kids! Thanks for posting it! The book looks great for little kids. Last year we did spring color collage by picking different flowers and leaves in the backyard and sticking them on the contact paper. We love this little Bunny! My daughter has another book called "Bunny's Noisy Book" and it is such a precious little book. As you know, I love this book and the illustrations. I think the poetry part is perfect to add in for National Poetry Month.